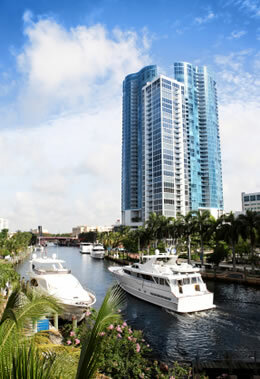 With the exception of Miami, the Fort Lauderdale cruise port has become one of the most active and popular cruise ports in the United States. 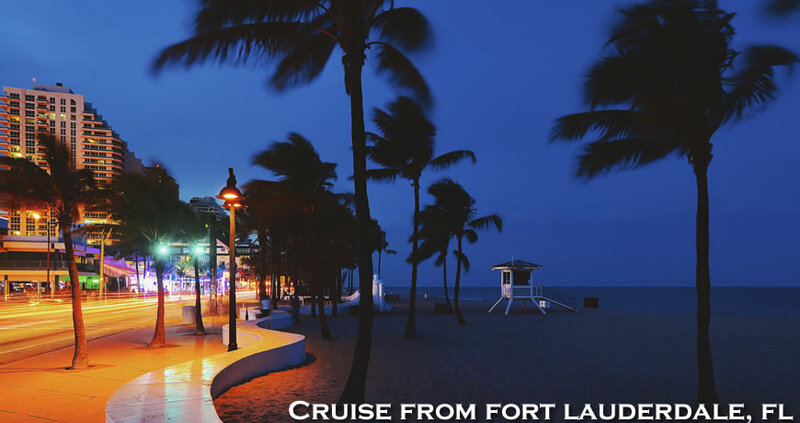 Cruise Lines such as Carnival, Celebrity Cruises, Crystal Cruises, Cunard, Holland America, Princess, Royal Caribbean, Seabourn and Silversea all offer a wealth of cruise itineraries departing from Fort Lauderdale, Florida. In fact, the largest cruise ship in the world, which is the Royal Caribbean Allure of the Seas currently offers 7-night Eastern and Western Caribbean cruises year-round from Fort Lauderdale, Florida. BRAND NEW for 2015 & 2016, Royal Caribbean's NEWEST cruise ship, the Harmony of the Seas will also provide 7-Night Caribbean cruises from Ft. Lauderdale. 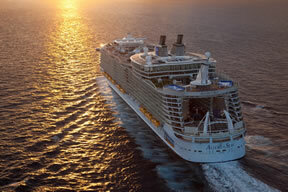 In addition to these Royal Caribbean cruise ships, several other cruise options are available from Fort Lauderdale. 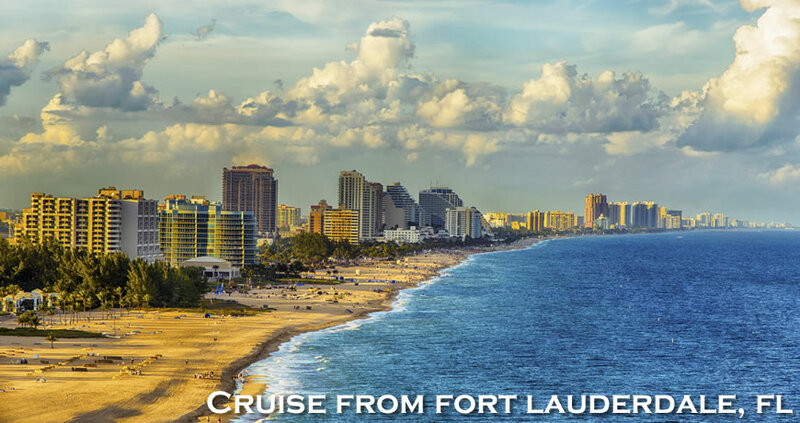 Call Direct Line Cruises at 1-800-352-8088 to discuss cruising options from Fort Lauderdale, Florida. Although the name is Port Everglades, the port is not part of the Everglades at all, but actually in Fort Lauderdale, on the southeastern coast of the Florida peninsula. There are a couple of airports nearby, so compare fares including transfer costs carefully to find the best deal. When you fly into Fort Lauderdale-Hollywood International Airport (FLL) you are close enough to the pier to see the ships in the distance! It’s less than 10 miles. Taxis are lined up outside the doors of the baggage claim area and the cost is about $12 for up to five passengers, based on the meter reading. Shared van services will run from $8 pp to $12 pp. Miami International Airport (MIA) is a bit further away; about 30 miles and a taxi can cost approximately $100. There are shared shuttle services for about $15pp. For those of you driving to Port Everglades illuminated, security-patrolled parking garages are available and the cost is $15 per day. Say Fort Lauderdale to some and what comes to mind is “spring break” craziness! But over the past few years the city has matured into a cosmopolitan city that now attracts a more sophisticated and affluent tourist. With 23 miles of sun-drenched shoreline the perfect beach is always just steps away. It has been called the “Venice of America” because it is positioned by the New River and the Atlantic Ocean, and crisscrossed by numerous inland waterways. 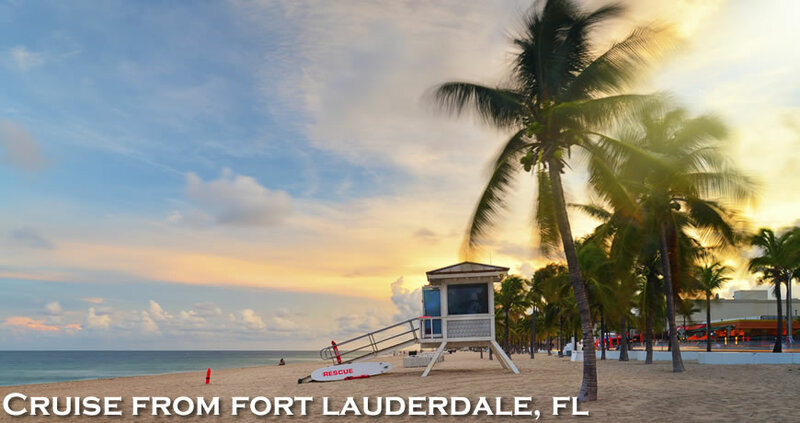 There is so much to discover here, that a pre or post stay cruise stay in Fort Lauderdale would be a nice way to extend your vacation. Las Olas Boulevard: A sophisticated mile of fashion, art and sidewalk cafes. For dining, Las Olas is a food lover’s paradise. There’s a profusion of fabulous restaurants in every price range of just about any kind imaginable – Italian, Asian, Greek, Mexican, or French. The many eclectic boutiques and high-end designer shops are comparable to a Rodeo Drive experience. Explore the Waterways: Whether you travel by kayak, gondola, or even the Jungle Queen Riverboat, a day spent along the river and canals is lovely way to spend an afternoon. If you choose one of the many narrated tours available you’ll see everything from centuries-old mangroves to opulent multi-million-dollar celebrity homes and yachts. Riverwalk: This one mile brick-lined promenade runs along the New River. 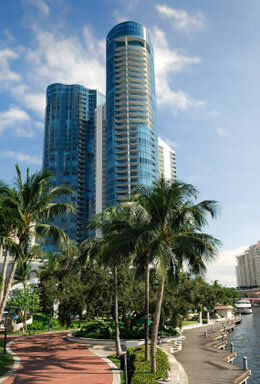 The lavishly landscaped path is lined with shops, restaurants and attractions such as The Broward Center for the Performing Arts, The Museum of Discovery and Science, and the Opera House. Seminole Indian Village: Located on the Hollywood Seminole Indian Reservation at the Seminole Hard Rock Hotel and Casino. Here you can learn about the history and culture of the tribe by visiting their traditional village. Demonstrations by tribal members include cooking, woodworking, and doll making. Catch the excitement of the worlds only deep water alligator wrestling show. Wildlife presentations include over 30 species of Florida’s native animals including panthers, otters, bobcats, bears, and more. Bonnet House Museum & Gardens: Bonnet House was designed and built in 1921 by American artist Frederic Clay Bartlett. It showcases his art work and collections of everything … from carved animals, shells, pottery, and over 2,000 orchids. The design is, to say the least, unique. Be sure to take the narrated tram tour of the expansive gardens. You may even catch a glimpse of the resident monkeys that roam the property. Parking at Pier: $15.00 per day for cruise passengers. *Parking rates are subject to change at any time. •Exit Airport and follow signs for US-1 North/ Port Everglades. •Exit leads into Eller Drive. •Follow the signs to your ships terminal. •Take 836 East to I-95 North. •Exit I-95 North at 595 East. •Follow 595 to the end; then follow the Port Everglades signs. Sign up to join Direct Line Cruises e-newsletter, which contains cruise news, reviews and EXCLUSIVE cruise deals. © 2016 Direct Line Cruises, Inc.. All Rights Reserverd.